For all of you, Happy Thanksgiving! And a special treat for our journalist friends, some of whom will be working during the holiday weekend, a little humor to pass the time. First up, the Twitter sensation, Fake AP Stylebook, @fakeapstylebook. Next, check out Overheard in the Newsroom, available in Facebook and Twitter (@ohnewsroom) flavors, too. 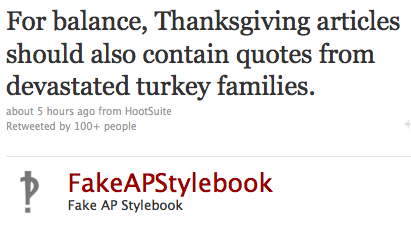 This entry was posted in Updates and tagged Fake AP Stylebook, humor, Overheard in the Newsroom, Thanksgiving. Bookmark the permalink.